As we mark the occasion of the 15th anniversary of 9/11, it is useful to reflect on the nature and scope of the global jihadist threat and its likely trajectory in coming years. The death of Osama bin Laden and the Arab Spring five years ago seemed like it would usher in an era when terrorism would not be a central national security concern. Instead, the Arab Spring inaugurated anarchy and civil war in much of the Middle East, out of which sprang ISIS, itself a derivative of bin Laden’s al-Qaeda. 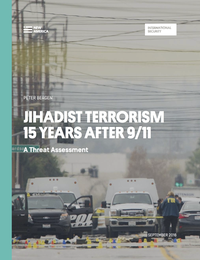 New America Vice President Peter Bergen assesses the scope of the jihadist terrorism threat in the United States and around the world in this new report, "Jihadist Terrorism 15 Years After 9/11."